Lough Derg, historically Lough Dergart (Irish: Loch Deirgeirt), is a freshwater lake in the Shannon River Basin. It is the second-biggest lake in the Republic of Ireland and the third-biggest on the island of Ireland (after Lough Neagh and Lough Corrib). Lough Derg is the largest lake on the Shannon system, stretching 34.5km from Portumna at the northern end to Ballina/Killaloe situated at either side of the southern end. It has a surface area of 117km2 with an average depth of 7.5m. Its deepest point is 36m, off Parker’s Point near the southern end. The land around Lough Derg carries the full range of agricultural activities including dairy- farming, sheep and cattle grazing and tillage. Nenagh in Co. Tipperary is the closest large town to Lough Derg and also on the Tipperary shoreline are the villages of Terryglass, Dromineer and Garrykennedy all of which have marinas and facilities for boating, sailing and fishing. On the Clare shoreline, the villages of Scariff, Whitegate and Mountshannon offer similar facilities. 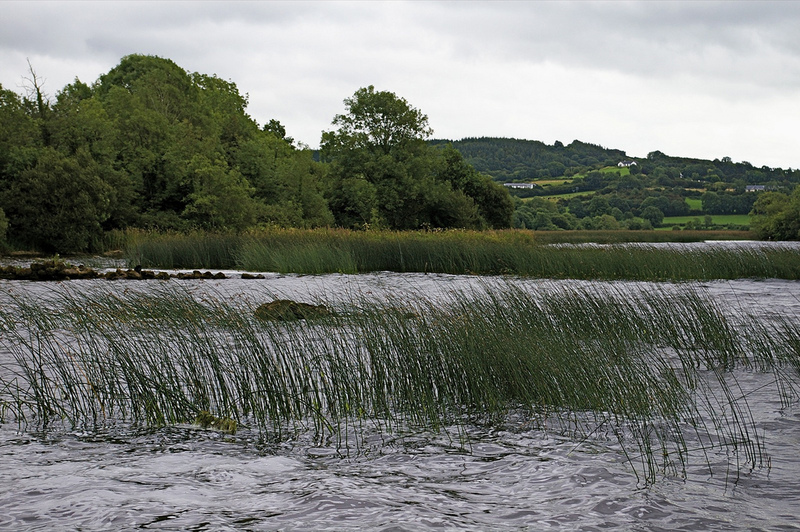 Apart from the main Shannon River, Lough Derg is fed by several tributary rivers, the largest by far being the Nenagh river which enters Lough Derg at Dromineer. Other tributaries include the Woodford, Ballyfinboy, Scariff and Crow as well as some other smaller but important tributaries. Lough Derg has been described as the “Jewel in the Crown” of the mid western region. It is rich in wildlife with its many islands offering excellent habitat. It contains significant stocks of wild brown trout, pike, perch, roach and bream etc. It is extremely significant as a tourist destination for angling, sailing, cruising and other water sports. There are numerous hotels, guesthouses, pubs and restaurants around the lake that cater for the tourists who visit the area each year. A breeding pair of white-tailed sea eagles have successfully fledged young on an island in Lough Derg over the last few years. 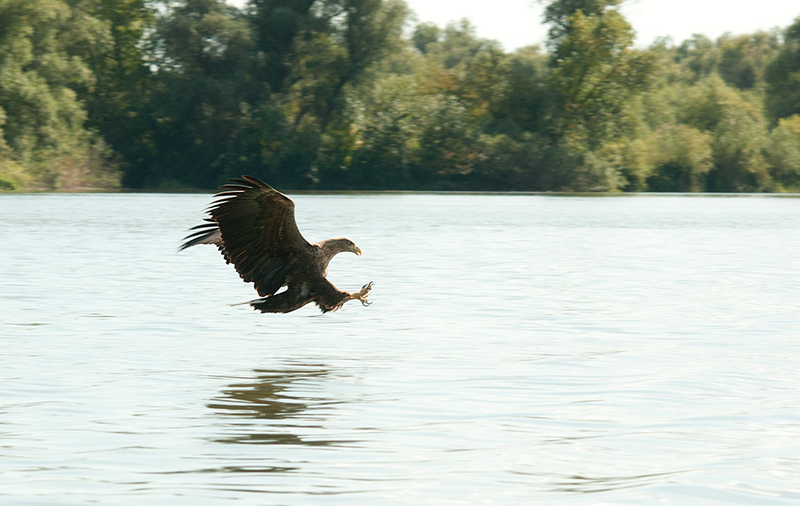 The success of the white-tailed sea eagles is the greatest success story of the Irish reintroduction programme started in the summer of 2007. Lough Derg offers some breathtaking scenery to the visitor. Much of the land around the lake rises quite steeply and areas such as the “Look Out” or the “Graves of the Leinster Men” offer views of the lake to compare with any of the prime tourists spots in Ireland. Like most waterways, there are concerns for its welfare. Threats of pollution from agriculture, industry and forestry need to be strictly monitored and controlled in an integrated way by the Government agencies such as Inland Fisheries Ireland, National Parks and Wildlife Service, EPA and the local authorities of North Tipperary, Clare and Galway, who have a significant statutory responsibility for water quality. In the past few years the threat from invasive animal species, such as the ‘Zebra Mussel’ (Dreissena polymorpha) and invasive plants such as ‘Curly Waterweed’ (Lagarosiphon major) and ‘Nuttall’s Waterweed’ (Elodea nuttallii) has increased. Legislation is urgently required to stop the importation of such destructive plants. If preservation orders were to be placed on many of its islands, this would ensure that such natural habitat would remain undisturbed for the benefit of wildlife and future generations.